In this year of centenary commemorations of the Easter Rising, I recall my happy discovery two years ago of a photo that reminded me – nostalgically – of my own role in the commemorations of the Rising, half a century ago. I was perusing Ernie O’Malley’s book, On Another Man’s Wound, given to me by my late brother Kevin, when I came upon a neatly folded page from the Sunday Press newspaper of Easter Sunday, 1966. It was part of the groundbreaking colour supplement commemorating the 50th Anniversary of the Easter Rising. To my amazement and delight, the page displayed a large colour photo of a 1916 Volunteer, Seán O’Duffy, in his original Irish Volunteer uniform and cap, ‘Presenting Arms’ to the National Flag and, opposite him on the other side of the flagpole, was my then 20-year-old self in my No. 1 Army Cadet uniform………..I was also presenting arms. The well-known Irish Press photographer, Colman Doyle, had taken this highly symbolic photo in tableau style, near Donnelly’s Hollow on the Curragh, to represent the evolution of the Defence Forces – from their origins with the Irish Volunteers in 1913 to the Army of 1966. Before I came across this newsprint copy the photo had remained hidden in a history book, untouched by hand, carefully secreted away by my brother for nearly 50 years! This serendipitous discovery brought back a flood of long buried memories. It brought to mind that in 1966, my Cadet Class- the 39th as we were then called- took part in the two major National Commemorative events that were held in Dublin: the Easter Parade and the official opening of the Garden of Remembrance in Parnell Square. I marched with my Cadet School contingent as one of the many Army Units taking part in that Easter Parade. I well remember marching up O’Connell Street towards the GPO, with 80 other Cadets of the combined 39th/40th Classes, six abreast, while overhead, a fly-past of four Air Corps Vampire jets momentarily drowned out the marching bands and startled the delighted crowds. As we passed the GPO, we proudly saluted the be-medalled veterans gathered there with an ‘Eyes Left’ order from our Class Officer, Captain Duffy. For the occasion, there was a huge platform stretching the full length of the GPO, where 600 survivors of the Rising and the War of Independence stood side by side to take the salute from the passing Army Units. Among them were also the more recent veterans of the Army’s first overseas engagement with the United Nations Peace Keeping Force in the Republic of Congo in 1960. At the head of these veterans on the reviewing stand were President De Valera and Taoiseach Seán Lemass. Hundreds of thousands of Dubliners and visitors filled every nook, cranny and tree from College Green to O’Connell Street to witness this wonderful tribute to the surviving men and women of 1916. The next day, Easter Monday, my 39th Cadet Class provided the Guard of Honour for the opening of the Garden of Remembrance in Parnell Square, opposite my old school, Coláiste Mhuire. We stood on the high back wall overlooking the ceremonies below us and presented arms when the No.1 Army Band played the National Anthem. Little did any of us young Cadets imagine then that 45 years later, our successors – the 87th Cadet Class- would also present arms as the National Anthem was played in the presence of Queen Elizabeth the Second, who was to bow there gently, in homage to the men and women of 1916 and to acknowledge their sacrifices in the creation of our State. Although I never did meet Mayoman Volunteer O’Duffy again after that photographic session in ’66, his memory lives on in two unconnected ways. In 1932, he presented a silver Cup to the nascent Irish Camogie Association. This was to be awarded to the winners of the Senior Camogie All Ireland competition, and to this day, the Captain of the All Ireland Camogie Champion’s team is presented with the O’Duffy Cup. Seán’s Irish Volunteer uniform, complete with cap and boots, is now on permanent display in the Soldiers & Chiefs Exhibition of the National Museum in Collins Barracks, Dublin. They are in a glass cabinet with other memorabilia of the 1916 Rising, and, because of my own curiosity in old history books, a new item is being added to the collection. 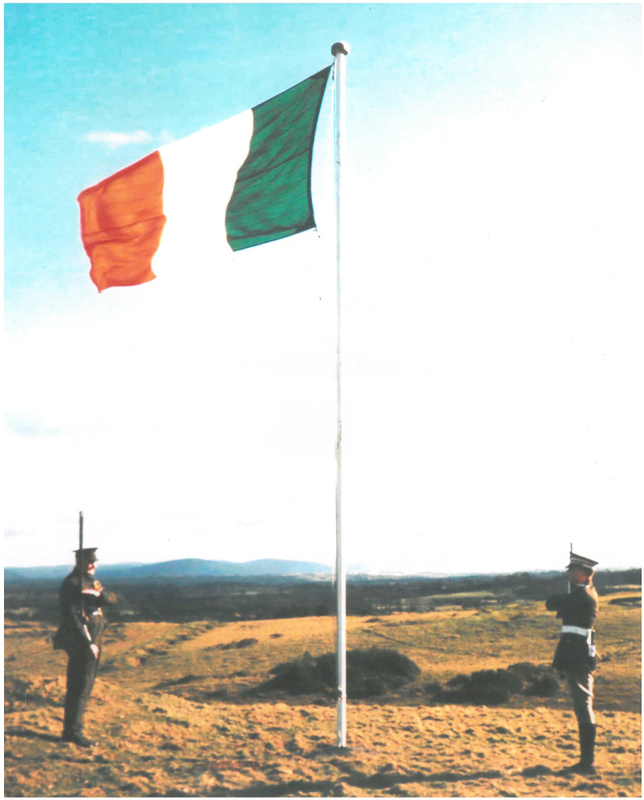 Now enjoying its place there is the once long forgotten colour photograph of Volunteer Sean O’Duffy and me, taken on a cold hilltop on the Curragh some 50 years ago this March.